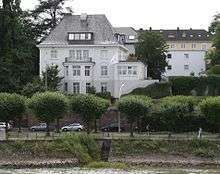 The Institute for the Study of Labor (German: Forschungsinstitut zur Zukunft der Arbeit) or IZA is a private, independent economic research institute and academic network focused on the analysis of global labor markets and headquartered in Bonn, Germany. Founded in 1998 IZA is a non-profit limited-liability organization headed by Klaus F. Zimmermann. As an independent non-profit institution, IZA draws financial support from the research-sponsoring activities of the Deutsche Post-Foundation and other national and international sources. It runs the world's largest research network in economic science, comprising over 1,300 international Research Fellows and Affiliates, as well as Policy Fellows from business, politics, society and the media. As of December 2014, the RePEc ranks IZA second of the top worldwide economic institutions in the field of labour economics as well as second of the top wordwide think tanks. In Germany it is the number one top economic institution. In conducting labor market research, IZA cooperates closely with the Economics Department at the University of Bonn where its director, Klaus F. Zimmermann, holds a position as full professor of economics, as well as the department's graduate education program at the Bonn Graduate School of Economics. IZA's main focus is the economic analysis of national and international labor markets within a broad range of research areas. Furthermore IZA provides policy advice on crucial labor market issues for national and international policy institutions. On March 1., 2016, the Institute for the Study of Labor is being split up and restructured by Klaus Zumwinkel, CEO of the Deutsche Post Stiftung and President of IZA. A new institute on behavior and inequality research is being founded whereby the residual of IZA is meant to focus on German labor market policy. Founding Director Klaus F. Zimmermann, who did not accept these developments, will leave IZA by the 1st of March 2016. To promote research on labor markets in developing countries, IZA launched in 2006, together with the World Bank, a joint research program on "Employment and Development". In addition, in its special research area "Growth and Labor Markets in Low Income Countries", IZA coordinates for the UK Department for International Development a substantial research program to promote growth and employment in low income countries. Since May 2014, IZA publishes, together with Bloomsbury Publishing, IZA World of Labor, an open access resource providing empirically founded research articles on labor economics for a non-academic readership. Since 2002 IZA awards yearly the IZA Prize in Labor Economics for exceptional academic accomplishments in the field of labor economics. It is endowed with an award of 50,000 euros and is among the most prestigious economics awards worldwide. ↑ "IZA - Institute for the Study of Labor". socialcapitalgateway.org. Retrieved 3 February 2015. ↑ "Ziele". Deutsche Post-Stiftung. Retrieved 3 February 2015. 1 2 "German Think Tanks - Research and Science in Germany - Research Centres from A to Z". Goethe-Institut. Retrieved 3 February 2015. ↑ Dietmar Henning (26 January 2015). "German corporations call for new forms of workplace extension". World Socialist Website. Retrieved 3 February 2015. ↑ "Field Rankings at IDEAS: Labour Economics". repec.org. IDEAS. December 2014. Retrieved 3 February 2015. ↑ "Rankings at IDEAS: Think Tanks". repec.org. IDEAS. December 2014. Retrieved 3 February 2015. ↑ "Within Country and State Rankings at IDEAS: Germany". repec.org. IDEAS. December 2014. Retrieved 3 February 2015. ↑ "Klaus F. Zimmermann". uni-bonn.de. Retrieved 3 February 2015. ↑ "Strategic Restructuring of the Institute for the Study of Labor (IZA)" (PDF). Institute for the Study of Labor. 15 December 2015. Retrieved 17 February 2016. ↑ "Labor Markets - Partnerships". World Bank. Retrieved 3 February 2015. ↑ "DFID - Research for Development > IZA/DFID Growth and labour markets in low income countries (LICs) programme". Department for International Development. Retrieved 3 February 2015. ↑ Olaf Siegert (27 November 2012). "EconStor Blog » Blog Archive » IZA launches 5 new Open Access Journals". econstor.eu. ZBW. Retrieved 3 February 2015. ↑ "IZA World of Labor". The Jobs Knowledge Platform (Press release). Retrieved 2015-04-10. ↑ "Professor Dan Hamermesh Wins Yet Another Prestigious Award - Economics home". royalholloway.ac.uk. Royal Holloway University of London. 19 July 2013. Retrieved 3 February 2015. ↑ "News & Announcements:Congrats to Prof. Amalia Miller on her IZA Young Labor Economist Award". virginia.edu. University of Virginia. Retrieved 3 February 2015. ↑ "The NBER Reporter Winter 20062007: Bureau News". Retrieved 3 February 2015. ↑ "LSE STICERD News and Visitors". Retrieved 3 February 2015. ↑ "Fabian lange - Publications". yale.edu. Retrieved 3 February 2015. ↑ "Alexandre Mas receives 2009 IZA Young Labor Economist Award". Woodrow Wilson School of Public and International Affairs. Retrieved 3 February 2015. ↑ "Harvard Faculty Raj Chetty CV" (PDF). Retrieved 3 February 2015. ↑ "The IZA Young Labor Economist Award 2011". ox.ac.uk. Retrieved 3 February 2015. ↑ "IZA Young Labor Economist Award". ucdavis.edu. Retrieved 3 February 2015. Klaus F. Zimmermann. Migration, jobs and integration in Europe. Migration Policy Practice, Volume IV, Number 4, October–November 2014, pp. 4–16.